Indian designer Tarun Tahiliani held a fashion show in Istanbul on Monday as part of mega-festival to exhibit Indian culture in Turkey. Tahiliani exhibited his collection "Passage and Renaissance of Indian Fashion." The Indian Embassy is hosting the "India along the Bosporus" festival between April 15-28 in the cities of Ankara, Konya, Izmir and Istanbul. "We hope to know the Turks better and be more than friends with them. We want to have a stronger relationship in modern times. 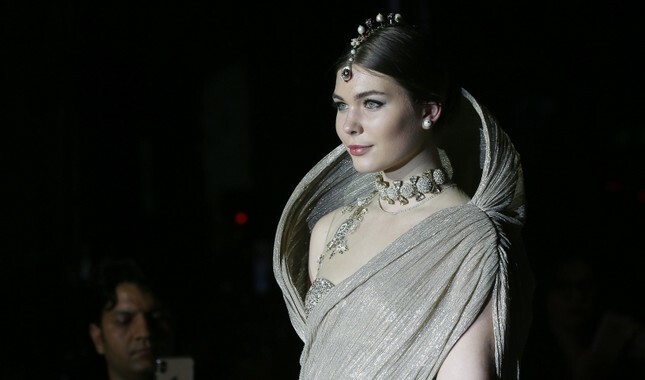 In all kinds of relations, culture is the most powerful bridge," Sanjay Bhattacharyya, India's ambassador to Turkey, told Anadolu Agency before the fashion show. "Istanbul is really a center of inspiration for Indians," Tahiliani said. "We use Islamic motifs in our fashion. So, Istanbul is a great resource for us. As a designer, it is very important to see the inspiration here." The festival will feature 10 different art forms. Classical Indian music and dance, Indian blues and funk, and Sufi music will be performed. Yoga and Ayurveda, a traditional healing system, will be introduced and workshops for Bollywood dance will be organized. Puppet theater performances and a rare photo exhibition of Mahatma Ghandhi, also known as the father of the Indian nation, will also be held during the festival.